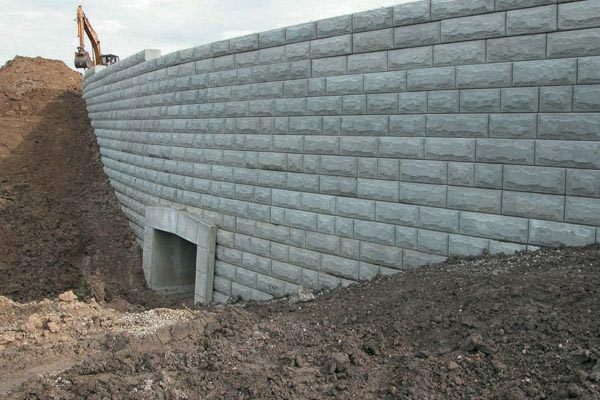 Verti-BlocksTM are interlocking concrete blocks designed to build retaining walls. Their size works for all types of landscaping, residential and commercial alike. They are easy to transport and install, even in difficult-to-reach areas. Since these blocks are hollow, they are lighter and require less handling, less equipment, and cost less to transport. The Verti-BlockTM solution is both attractive and affordable. With their unique size, original shape and variety of uses, Verti-Blocks are the ideal solution for all different types of projects. The Verti-Block wall in the inner courtyard contains a total of 450 concrete blocks, extending around 90 m (295 ft) long by 3.5 m (11.5 ft) tall. The blocks are solidly stacked and anchored one on top of the next, without the help of geogrids. This is an undeniable advantage when rocks are present, and if the neighbouring land is very near. Significant savings can also be made in terms of excavation time when geogrids are not required. 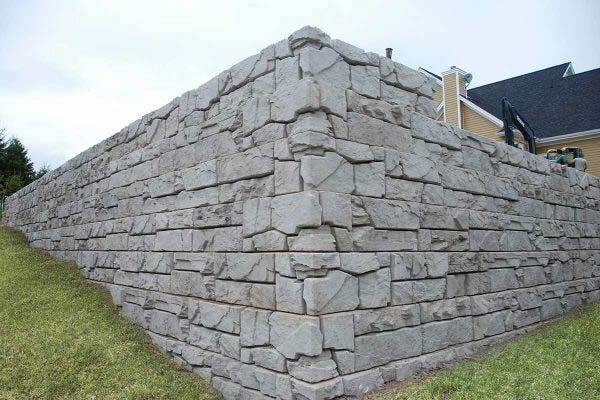 STONE STRONG® WALL: WIDTH AND MASS. 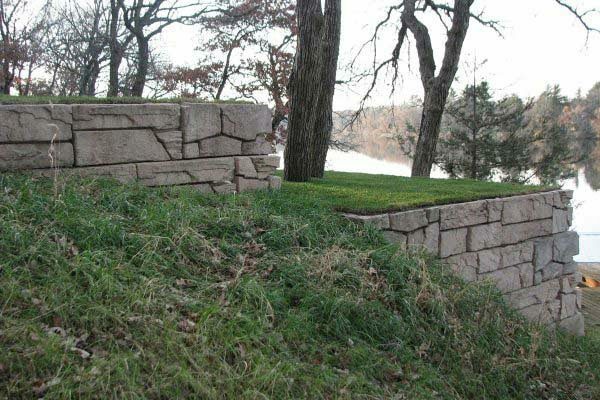 With their size and weight, Stone Strong blocks form true gravity retaining walls. 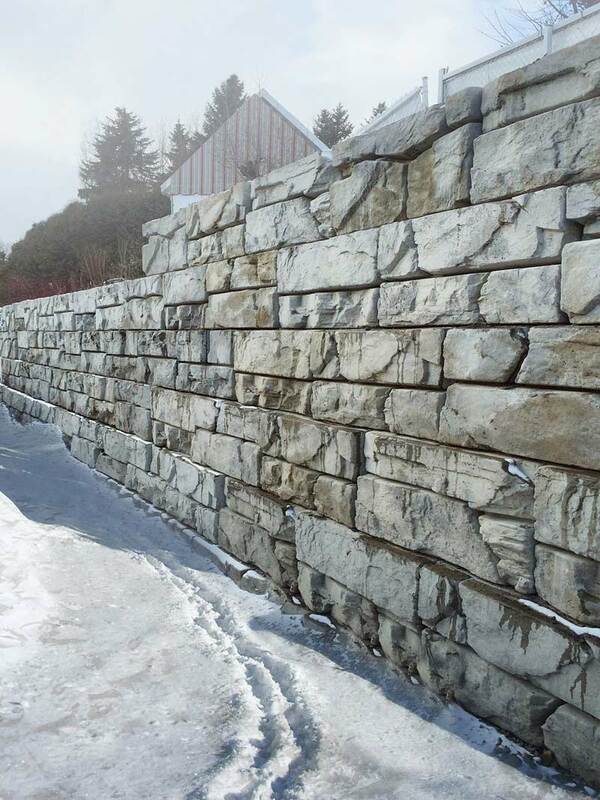 Stone Strong blocks are unparalleled in their strength, durability and appearance. 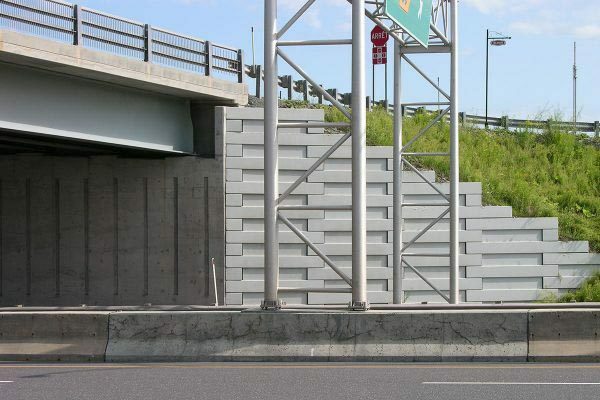 In spite of their large size, these precast concrete blocks are easy to install, and are not labour-intensive. They offer an innovative, high-performance and affordable solution. It is an eco-friendly option for applications in the water, or near a body of water. The blocks are manufactured under controlled conditions to ensure uniformity in their weight, respect of dimensional tolerance, and the desired strength. Our moulds are created using artisanal hand-chiselled stone blocks, producing attractive, realistic blocks. The blocks are made of air-entrained concrete, which allows them to withstand freeze-thaw cycles. They comply with the requirements set forth by the ministère des Transports, de la Mobilité durable et de l’Électrification des transports. STONE STRONG BLOCKS ARE UNPARALLELLED IN THEIR STRENGTH, DURABILITY AND APPEARANCE. The Ter-Voile process is simple to apply: a concrete structure stabilizes an embankment through a mechanical anchor in the ground. The structure is made up of concrete modules or wire mesh. The retaining system uses galvanized steel anchors. The system is known for its ease of installation and great stability. 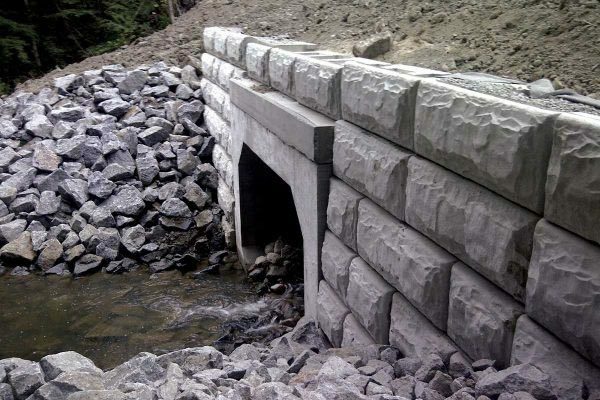 In addition to producing very tall retaining structures, it can be adapted to the natural slope of any terrain. Finally, it is approved by the ministère des Transports, de la Mobilité durable et de l’Électrification des transports. 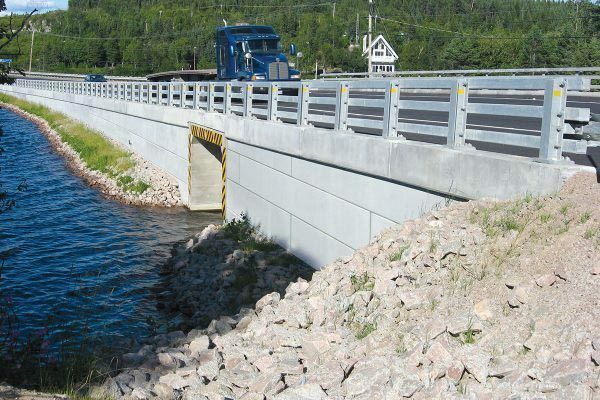 The Ter-Voile technology has been used in a number of large-scale projects in Quebec over the last several years. They include highways 5 and 50 in Outaouais, highways 20 and 85 in the Bas-Saint-Laurent, and the interchange between highways 25 and 440 in Laval. 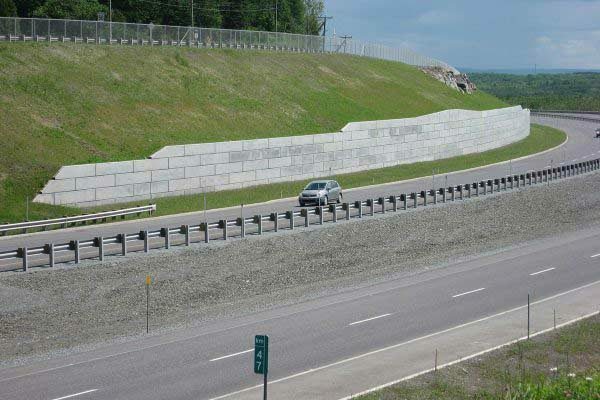 TER-VOILE, FOR VERY TALL RETAINING STRUCTURES THAT ADAPT TO THE NATURAL PROFILE OF THE TERRAIN. 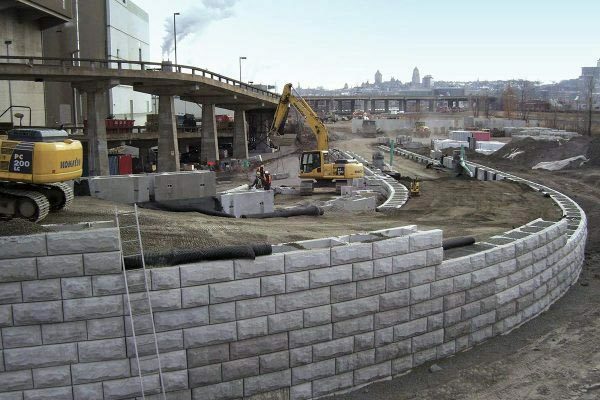 We also have standard concrete blocks with patterns that work for smaller retaining projects or other projects requiring a light embankment.